Raumfahrt+Astronomie-Blog von CENAP - Blog: Raumfahrt - TRUMP POLICY PROMISES MOON, MARS, AND BEYOND — WILL THIS TIME BE DIFFERENT? President Trump signed his Space Policy Directive 1 today, December 11, the 45th anniversary of when Apollo 17 astronauts Gene Cernan and Harrison “Jack” Schmitt landed on the Moon — the last humans to do so. Surrounded by administration officials, commercial space industry representatives, and current and former astronauts, including Schmitt, the only surviving member of the Apollo 17 crew, Trump promised to return astronauts to the Moon and go on to Mars and beyond. The words echo those of his two Republican predecessors, who did not achieve those goals. The question is whether the third time will be the charm. The directive itself modifies language in the existing U.S. National Space Policy issued by the Obama Administration in 2010. It replaces this paragraph in the Obama policy — “Set far-reaching exploration milestones. By 2025, begin crewed missions beyond the moon, including sending humans to an asteroid. 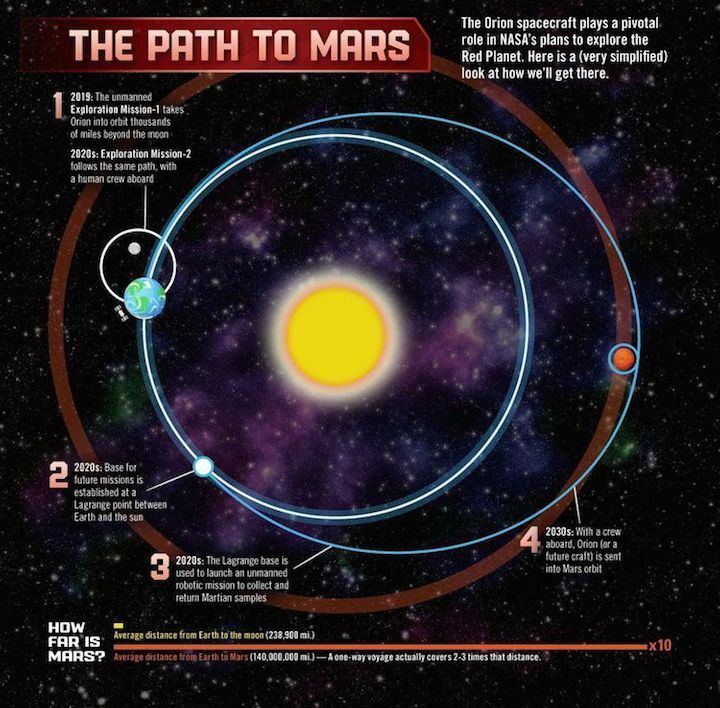 By the mid-2030s, send humans to orbit Mars and return them safely to Earth” — with new language. Section 1. Amendment to Presidential Policy Directive-4. “Lead an innovative and sustainable program of exploration with commercial and international partners to enable human expansion across the solar system and to bring back to Earth new knowledge and opportunities. Beginning with missions beyond low-Earth orbit, the United States will lead the return of humans to the Moon for long-term exploration and utilization, followed by human missions to Mars and other destinations;”. (d) This memorandum shall be published in the Federal Register. The new text does not explicitly state that the goal is a human return to the surface of the Moon, differentiating it from Obama Administration policy which involved activities in cislunar space around and near the Moon, but not placing American astronauts on the surface. It is implied, however. Trump statedthat he was pledging that Schmitt would “not be the last” American on the Moon and the directive refers to “long term exploration and utilization” of the Moon. Trump did not set a timeline for returning to the Moon or reaching Mars or mention cost. Three other Apollo missions to the Moon were cancelled as America’s fascination with human lunar exploration faded once the United States achieved the goal of beating the Soviet Union there. Bold goals to continue trips to the Moon and go on to Mars envisioned in the immediate post-Apollo period never gained traction, nor did pronouncements by President George H.W. Bush in 1989 or President George W. Bush in 2004. President George W. Bush’s plan to return astronauts to the lunar surface by 2020, called Constellation, was cancelled by Obama after a 2009 independent review concluded that NASA would need $3 billion more per year to implement it. Obama decided to focus instead on the “Journey to Mars” with the goal of putting humans in orbit around Mars in the 2030s, bypassing the lunar surface and saving the billions of dollars required to build a lunar landing system and associated lunar surface systems for habitation and exploration. Congress opposed the cancellation of Constellation on a bipartisan basis. A compromise was enacted in the 2010 NASA Authorization Act. NASA would still build a new big rocket, now called the Space Launch System (SLS) with a different design from Constellation’s Ares V, and a crew spacecraft to go with it. The crew spacecraft remained the same — Orion. Those programs have been ongoing throughout the Obama Administration and NASA is well on its way building a transportation system for sending humans beyond low Earth orbit, whatever the destination. The first launch of SLS/Orion, without a crew, is currently expected in the late 2019-mid 2020 time frame. The first launch with a crew is intended to take place no later than 2023. Nonetheless, completing those programs and building new capabilities needed for human trips to the lunar surface will cost a lot of money. That has been the downfall of previous efforts. Time will tell if the Trump Administration requests the requisite funding and if Congress appropriates it. The President’s FY2019 budget request, due to Congress the first Monday in February, will hold important clues. One difference is that the private sector has begun developing its own systems that could play a role in supporting humans missions to the Moon and elsewhere, such as SpaceX’s Falcon Heavy and Blue Origin’s New Glenn launch vehicles. International partners also are interested. An updated version of the Global Exploration Roadmap, developed by the United States and about a dozen other countries, is due to be released next month. Statements issued after the White House ceremony illustrate how different constituencies are viewing the announcement. Astrobotic, which is developing capabilities to deliver small payloads to the lunar surface with its Peregrine robotic spacecraft, called for NASA to respond with a “Lunar Surge” of robotic missions starting in 2020 prior to a human return. Several members of Congress were at the White House event, including Rep. Lamar Smith (R-TX), chairman of the House Science, Space, and Technology Committee, and committee members Reps. Brian Babin (chairman of the Space Subcommittee), Mo Brooks (R-AL), and Bill Posey (R-FL). Rep. John Culberson (R-TX), chairman of the House appropriations subcommittee that funds NASA also was there. The only Senator present was Sen. Bill Nelson (D-FL), one of the architects of the 2010 NASA Authorization Act and one of the Senate’s leading voices in support of human space exploration. He flew on the space shuttle in 1986 when he was a member of the House of Representatives. Other attendees included Apollo 11 former astronaut Buzz Aldrin, former astronaut Sandy Magnus, current astronauts Peggy Whitson and Christina Koch, Secretary of Commerce Wilbur Ross, Secretary of Transportation Elaine Chao, Vice Chairman of the Joint Chiefs of Staff Gen. Paul Selva, and Acting NASA Administrator Robert Lightfoot. THE PRESIDENT: Thank you very much, Vice President Pence, for helping — where’s our Vice President — great job, great job — to restore American leadership in space. So important. Cabinet members, General Selva, Deputy Secretary Shanahan, Acting Administrator Lightfoot, members of Congress, and the National Space Council, thank you all for being here. And especially, Mike, as I said, I want to thank you. I know how active you’ve been and how important this is to you. So we appreciate it. Thank you very much. We also welcome astronauts Christina Koch and Peggy Whitson. Christina, thank you. Peggy, thank you very much. Peggy recently returned from the International Space Station and has now spent an incredible 665 days in space. You’ll have to explain that. That sounds tough. (Laughter.) More than any other American; more than any woman ever. Finally, we’re honored to be joined by Apollo astronaut Jack Schmitt. Exactly 45 years ago, almost to the minute, Jack became one of the last Americans to land on the moon. Today, we pledge that he will not be the last. And I suspect we’ll be finding other places to land in addition to the moon. What do you think, Jack? Where’s Jack? What do you think, Jack? We’ll find some other places out there? There are a couple of other places, right? MR. SCHMITT: Yes, we should. Learn from the moon. THE PRESIDENT: We’ll learn. The directive I’m signing today will refocus America’s space program on human exploration and discovery. It marks an important step in returning American astronauts to the moon for the first time since 1972 for long-term exploration and use. This time, we will not only plant our flag and leave our footprint, we will establish a foundation for an eventual mission to Mars. And perhaps, someday, to many worlds beyond. This directive will ensure America’s space program once again leads and inspires all of humanity. The pioneer spirit has always defined America, and we’re picking that up in many other fields. I think you see that. I think it’s obvious. All you have to do is look at what’s happening with the markets and all of the great things that are happening. We’re leading in many different fields again, and it’ll get more and more obvious as you go along. After braving the vast unknown and discovering the new world, our forefathers did not only merely sail home — and, in some cases, never to return. They stayed, they explored, they built, they guided, and through that pioneering spirit, they imagined all of the possibilities that few dared to dream. Today, the same spirit beckons us to begin new journeys of exploration and discovery, to lift our eyes all the way up to the heavens, and once again imagine the possibilities waiting in those big, beautiful stars if we dare to dream big. And that’s what our country is doing again: We’re dreaming big. This is a giant step toward that inspiring future and toward reclaiming America’s proud destiny in space. And space has so much to do with so many other applications, including a military application. So we are the leader and we’re going to stay the leader, and we’re going to increase it many-fold. I’d like to invite Vice President Pence, if he would, to say a few words. He’s been leading this for me and I appreciate it. THE VICE PRESIDENT: Mr. President, thank you. Thank you for your leadership and thank you for the honor to be here today in my capacity as chairman of the National Space Council for what I believe is a momentous occasion in the history of American space exploration. To all the extraordinary leaders who are gathered with us today, to members of Congress, and the pioneers of space exploration who are gathered here, we thank you. We thank you for all you’ve done to serve our nation and expand the horizons of human knowledge and advance American leadership in outer space. Mr. President, in signing this space policy directive, you are ensuring that America will lead in space once again. To guide this new era of American space leadership, President Trump has relaunched the National Space Council. And at the Council’s inaugural meeting in October, we unanimously approved a recommendation to instruct NASA to return American astronauts to the moon, and from there to lay a foundation for a mission to Mars. Today’s action by President Trump makes that recommendation official national policy for the United States of America. As everyone here knows, establishing a renewed American presence on the moon is vital to achieve our strategic objectives and the objectives outlined by our National Space Council. In pursuing these objectives, Mr. President, we will, as you said, enhance our national security and our capacity to provide for the common defense of the people of the United States of America. We will also spur innovation, as the space program has always done, Mr. President. You’ve reflected on it often, and we’ll see jobs created that we couldn’t even imagine could be created today. We’ll also ensure, lastly, that the rules and values of space exploration are written with American leadership and American values. Mr. President, you’ve said that the pioneer spirit has always defined America. And by your action today, with this clear vision — returning Americans to the moon, preparing to lead to Mars and beyond — you’re ensuring, Mr. President, that America will lead in space in the future and for generations to come. And I thank you for the honor of being a part of this. THE PRESIDENT: This is very exciting and very important for our country. And it also happens to mean jobs. Jobs. And we love jobs too, right? Congratulations. THE PRESIDENT: Thank you, everybody. Thank you very much. Apollo 11 astronaut Buzz Aldrin also was there, although his name is not on that list. What the new directive ultimately means is difficult to assess in the near term. Presidential statements pronouncing bold goals for the U.S. space program have come and gone. The glimmer of light that this time might be different comes from the investment that is already underway in SLS and Orion, the growth of the commercial space sector that could help in implementation, and the interest of many other countries in participating in whatever human exploration program follows the International Space Station. But the perennial hurdle is money. The President’s FY2019 budget request will be the first test of the Trump Administration’s true interest.